Take advantage of these free fun things to do in Santa Monica! We have put together a great list of Santa Monica family and outdoor activities that you should add to your list of stuff to do during your next visit to the Los Angeles area. Grab a towel, sun block, and a good book and head out to enjoy the Southern California scenery on the picturesque Santa Monica Beach, which stretches for 3.5 miles between Venice and Malibu. Take a stroll on Santa Monica Pier, hailed as the oldest pier on the West Coast of the United States. The Pier is open year‐round and is the perfect spot for viewing a sunset or taking a romantic walk under the stars. Catch a glimpse of the nine‐story Ferris wheel at Pacific Park. It is the only solar-powered Ferris wheel in the world and has been seen by millions in the opening shots of NBC’s Tonight Show with Jay Leno, American Idol, and ABC’s Private Practice. Pay a visit to the 3rd Street Promenade by evening. Street performers and entertainers light up this pedestrian‐only boulevard with the sound of drums, acoustic guitars, and tambourines. Stop to watch the acrobats, dancers, psychic cats, mimes and bubble blowers, just to name a few. Celebrate the holiday season by checking out the Shopping Cart Tree at the Edgemar Center on Main Street or by enjoying the tree lighting ceremony at Santa Monica Place. Take the kids to enjoy the duck pond, reflective pools and streams of Douglas Park in Santa Monica’s Wilshire Boulevard neighborhood. Make a day of it with the shady picnic tables and sandy play area. Window shop along Montana Avenue, a 10‐block open‐air, retail destination frequented by affluent Angelenos and well-informed visitors. This upscale and open-air retail destination is flush with stylish boutiques and innovative wellness experiences, and the perfect location to for a leisurely stroll. Get a unique view into the ocean world just outside its doors at the Santa Monica Pier Aquarium. The Aquarium is home to dozens of species of marine animals and plants. Admission is free for children under 12 when accompanied by an adult. Let the kids cool off at the splash pad in Virginia Park (May‐September). This park is also known as a great place for pick‐up basketball games. 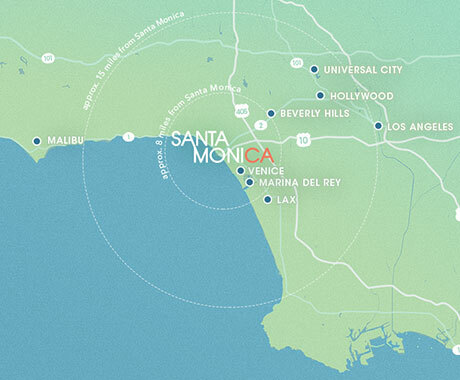 Stop by one of the Santa Monica Visitor Centers to chat with one of Santa Monica Travel & Tourism’s friendly travel counselors and get free maps, brochures, and insider tips on local restaurants, hotels, and entertainment. (2427 Main Street, 1400 Ocean Avenue, 200 Santa Monica Pier and 1300 Block of Third Street Promenade). Walk down Main Street to discover quintessential beach life with a hip, urban edge. Peruse the lively and eclectic boutiques, chic clothing stores, and design showrooms. On Sundays, visit the farmers market for free music and great people watching. Get a checkmate at the International Chess Park, the city’s seaside chess center that offers over 100 player seats and plenty of local character. Photo buff? Capture Santa Monica’s quintessential Southern California setting as you take in the varied landscapes and natural beauty with your camera. Sway to the tunes at the Twilight Concert Series on the Santa Monica Pier, which has been featuring free evening concerts Thursday nights in the summer for the past 31 years. Cheer on the professional and student trapeze artists during a free flying trapeze show on the Santa Monica Pier. Check their Facebook to see the newest show themes and times. Make it a movie night under the stars on the Santa Monica Pier. In a series of four Friday evenings in October, movies are projected onto a huge screen in the open air. Stroll among the vibrant stalls of Santa Monica’s weekly farmers markets for some of the world’s freshest produce at three locations throughout the city: Arizona at Third Street, Pico Boulevard, and Main Street. Watch a stunning California sunset from one of the many fantastic vantage points along the sand, or from cliff level in Palisades Park. Indulge your ears with “Jazz on the Lawn” at Santa Monica City Hall on Sundays in August, where talented jazz artists bring their own flavor to the genre. Watch the grunion spawning runs from Santa Monica Beach. Take the kids to enjoy the aeronautical-themed play activities at Clover Park. Enjoy gardens, public art, exhibitions, volleyball, beach tennis, and a playground at the Annenberg Community Beach House, the only public beach house in the United States. Enjoy watching the comings and goings of private jets at Santa Monica Airport. Rich with history dating back to 1919, the airport has two free and easily accessible viewing areas where the public is invited to watch aircraft activity. Pay your respects at the Arlington West Memorial, a project of Veterans for Peace. The Memorial offers visitors a graceful, visually and emotionally powerful place for reflection. Every Sunday from sunrise to sunset, a temporary memorial is created on the beach just north of the world famous pier in Santa Monica. Visit the location of Bay Watch. Visit the beach Will Rogers State Beach, once home to the iconic television program Bay Watch. Accessible at the northern end of the bike path, Will Rogers State Beach offers excellent swimming, beach activities, and is the headquarters of the Los Angeles County Lifeguards. Explore the eclectic Pico Boulevard neighborhood at the southern end of Santa Monica. Tour the Natural Resource Defense Council building in Downtown Santa Monica to learn about the environmental watchdog’s efforts to protect the planet. Cast your line of the end of the pier and enjoy a day of fishing in our local waters – no permit required. Stretch your artistic skills and let your imagination flow with a family sand castle competition on the beach. Stroll through Palisades Park to take in the many historical monuments that stand testament to the city’s history and culture. Marvel at the magnificent 100-year-old Moreton Bay Fig Tree at the Fairmont Miramar Hotel & Bungalows. Visit the DC‐3 monument that commemorates the legendary aircraft built in Santa Monica’s Clover Field in the 1930s‐40s. Get amazed by watching the various aerialists and acrobats flexing their muscles at the original Muscle Beach. Celebrities such as Jack LaLanne, Jayne Mansfield, and Mae West were frequent visitors at Muscle Beach and helped to establish Southern California as a body builder’s paradise and the home of the international fitness boom in the early 1920s. Pay your respects to stars like Glenn Ford and Ingrid Bergman at City of Santa Monica’s Woodlawn Cemetery, an old‐fashioned cemetery with a sea of large, tall headstones. Enjoy the natural beauty and pick up a map for a walking tour. Hunt for Santa Monica’s many green‐friendly businesses. City partners have joined to implement the Santa Monica Certified Green Business program. Look for these decals in storefronts showing that they meet the “green” requirements. Pack a picnic and spread out on the lawn at Palisades Park. Visit the end of the historic Route 66. See the spot that is home to the “End of the Road” plaque, signaling the terminus of the original US highway that ran from Chicago to Santa Monica. Learn the rich history of the Santa Monica Pier through a free walking tour on Saturday and Sunday mornings beginning at the Pier Shop. Check out Mid-City Santa Monica for an eclectic assortment of major businesses that call or have called Santa Monica home, like major film, television and music companies Universal and Sony. Celebrate summer with the city’s “Summer SOULStice,” a celebration on Main Street that offers a lively scene with many cover performances. Attend a neighborhood Open House! Every December, both Montana Avenue and Main Street are on display with free food, festive drinks, and holiday caroling. Don’t let limited mobility stop you! Loan a sand wheelchair from Perry’s Café and Beach Rentals and gain access to the water’s edge. Bring friends and neighbors to celebrate the community’s rich history and environmental resources at the annual Santa Monica Festival, at Clover Park each May. Enjoy Fireworks at Santa Monica College in celebration of our nation’s Independence Day (Saturday before 4th July). 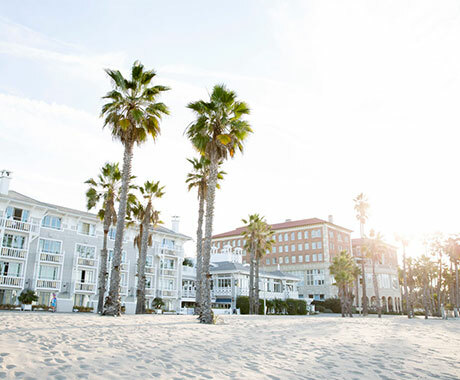 Take a 30‐minute walk south from Santa Monica to enjoy the colorful ambiance of Venice Beach. Test your skills at croquet or horseshoe tossing at Emerson Reed Park. Set up a picnic for the kids at the Ocean Park beach play area for endless of hours of fun for younger kids with climbing structure, swings and scooping toys. Join the fun of the Winterlit celebrations on 3rd Street Promenade, with ‘snow days’, carolers and other seasonal entertainment. Visit the bronze plaque that acknowledges the 200-foot strip of sand that was segregated in the 1920s to 1950s. Known as Inkwell Beach, this infamous beach ran between Bay Street and Pico Boulevard. Keep an eye out for the varied wildlife off the beach, including pelicans, dolphins, and rare sightings of migrating gray whales as they head south to their winter breeding grounds in the warm waters off Mexico. Try a Downtown Santa Monica walking tour where guides will show you celebrity “hotspots,” well-known attractions, historical hotels and more! Download a Santa Monica Pier scavenger hunt and other beach-themed educational activities for your kids.